One of my fondest memories of my college days was an event the UCLA Computer Club organized (I have no idea how) when we brought Bill Scott and June Foray in to speak about Bullwinkle. So almost a year ago, when we saw that the La Mirada Performing Arts Center (FB) was bringing in Animaniacs Live, we were sold (and a good thing, because the show did sell out). Last night was the show, and we had a blast. For those unfamiliar with the series, Animaniacs was part of the resurgence of Warner Brothers animation on TV in the early 1990s, much of it the brainchild of Tom Ruegger (FB). This resurgence started with Tiny Toon Adventures, and continued with the spinoff Pinky and the Brain (a personal favorite) and Freakazoid!. The new stage show, Animaniacs Live, consists primarily of Randy Rogel (FB) and Rob Paulson (FB) telling stories about the making of the show, and singing songs from the show, backed by a large orchestra (in the show we saw, the La Mirada Symphony Orchestra (FB)). Rogel was one of the main composers (music, lyrics) of songs on the show; Paulson voice Yakko, Dr. ScratchandSniff, and numerous other characters. Depending on availability, they bring in other principals and voice talent from the show. In the La Mirada shows, this included Jess Harnell (FB) who voiced Wakko, and Tress MacNeille who voiced Dot¹. Also featured were Steve Bernstein (FB) and Julie Bernstein, who were involved in the original scoring of the show and some of the music numbers (Steve conducted the orchestra for a few songs, and Julie provided some background vocals), as well as someone whose name I don’t remember in the orchestra. Additionally, it turned out the both creator Tom Ruegger (FB) and director Andrea Romano were in the audience for our performance. The show consisted of two acts, followed by a question and answer session. During the two acts, Rogel and Paulson sang songs from the show (occasionally along to animated clips), with Harnell and MacNeille occasionally joining them. These four exhibited very different personalities. Rogel and Paulson were as reasonable and normal as anyone associated with animation would be 🙂 — in other words, normal suits, normal personalities, great stories, wonderful rapport with both the audience and each other. This likely befits their nature as actors first. Harnell had an outsized adult personality like a rock musican, coming out in a different glitter suit each time. MacNeille seemed a lot more shy on stage — seeming to prefer her characters more than letting the real Tress out. All in all, a wonderful show. If you get a chance to catch it in your city, do so. Upcoming Shows: Next weekend brings Sister Act at Cabrillo Music Theatre (FB). The last weekend of April brings the Renaissance Pleasure Faire on Saturday, and the new musical The Theory of Relativity at Harter Hall/Charles Stuart Howard Playhouse (FB) on Sunday. Lastly, looking to May, the schedule shows that it starts with My Bodyguard at the Hollywood Pantages (FB) the first weekend. It continues with Martha Graham Dance and American Music at the Valley Performing Arts Center (VPAC) (FB). The third weekend brings the last show of the Actors Co-op (FB) season, Lucky Stiff, at Actors Co-op (FB). May concludes with Hello Again at the Chromolume Theatre (FB), and hopefully Five Guys Named Moe at Ebony Repertory Theatre (FB). As for June? Three words: Hollywood Fringe Festival (FB). That, barring something spectacular cropping up, should be the first half of 2017. There’s a problem with certain titles and shows. For example, consider Titanic — either the movie or the musical. You know what is going to happen: the ship is going to sink. You center the show around the subject of the title, and there won’t be any story of interest. Fate is preordained. But find an interesting story related to that subject, and things might survive. Titanic the movie wasn’t the story of the ship — it was the story of Jack and Rose. Titanic the Musical wasn’t the story of the ship — it was the story of the class system, the people on board, and the battles over the construction of the ship. Given that we know that the building will be built, where’s the story in Empire? It’s a good question … and it must be answered quickly, because the audience will be wondering. After all, there hasn’t been a successful musical about a skyscraper in New York before. If you think about it, there are only two possibilities: the battle over the construction of the building, and stories about people related to the building. The former has the problem of foreknowledge: you know that whatever the story is, the building will be built. This is the problem that Caroline Sherman and Robert Hull faced. They had to find a story that worked, and build a musical around that. Before I go into what they did and how it worked (or didn’t), here’s the BLUF: the execution was spectacular and the resultant building was beautiful, but the internal structure is not as strong as it could be, and it is unclearer whether the building, as currently constructed, will survive the journey to the other coast. The story that Sherman and Hull opted to tell is primarily about the clash and romance between the lead architect, and the “Can Do” gal of Al Smith, ex-Governor of New York, who he has on the project to ensure it gets done right. There are secondary stories about the construction workers on the building, who are putting their lives on the line to build the building. I’m hesitant to go into too many details on the latter, as I don’t want to spoil the few reveals in the story. Either of the two could work for the story — the audience just needs to have their expectations managed. This is where the problems of this show lie. The first act of the show focuses too much on the known result: Will the building get built? Who will build it? It doesn’t rapidly set up and get us into the story it wants to tell: the love story of the architect and the “Can Do” gal, or the story of the workers and their sacrifices. The focus is on the building of the building, not getting to know these characters and their inner desires. Musicals excel when they tell the story of people, and use their music to highlight the inner story and conflict within — the songs in our hearts, so to speak. Musicals fail when they focus on the scaffolding — the songs of the place and the surroundings. The first act exemplifies these failures: we never get to know our lead characters as people. Who is Michael Shaw, the architect, other than some young kid who wants to build the building? Who is Frankie Peterson, other than a “Can Do” gal who can pull a solution out of anything? Who is Ethan O’Dowd, other than a possible new father, working on the building? We never find these things out (or, to the extent we do, they are told to us very briefly). Instead, we learn about the desire and conflicts to build the building, the stereotypical cat-calls of the crew, and the importance of “moxie”. My belief — and I’m clearly an observer in the cheap seats — is that for this musical to succeed, the first act needs to be trimmed and focused more on the inner desires of the people, and less on the place. The musical may be called Empire , but it’s focus cannot be on the physical structure being built — it needs to be on what else is being built and destroyed around that building. In other words, at least with respect to the first act, this show doesn’t clearly set out the vision of what it wants to be, and what story it clearly wants to tell. The audience, by intermission, is wondering why they are seeing this. They aren’t fully invested in the people they need to care about — they are distracted by the building. Luckily, the second act of the story redeems the effort, primarily because it focuses on precisely that which the first act forgot: the people. We get to know the leads beyond their stereotypes, and appreciate their connection. We get to know more stories about the workers. The ultimate end of the story is good, but the path there was problematic. The other problem on the path — and one that might doom this show — is reflected in real life. The Empire State Building was once the tallest building in NYC. It isn’t now; it has been eclipsed by newer and flasher buildings the reflect modern sensibilities. The older buildings can be retrofit to add some modernity, but they are still old buildings. Some old buildings are so well constructed that the lack of modernity is not a problem. Others can’t overcome that flaw. That applies to Empire The Musical as well. In its style, it is clearly a 1960s era musical. Lots of big dance numbers. A love story. But it is also conventional: the musical tends to be the standard musical-theatre style music, often with songs of place, not people. The story is filled with musical theatre conventions, stylistic characters, and tropes. Going in, you know where the story is likely to go. You get there, with perhaps one or two minor surprises on the end. But even those surprises aren’t surprises when you think about normal tricks in musicals. To put this another way: what has turned Broadway around have been the musicals that have challenged the conventional: skewering the style, bringing a new voice, bringing a new musical attitude, bringing voices to the previously voiceless. This musical does none of that. It is squarely conventional — and many squarely conventional musicals, while good, just haven’t become the long-lasting successes on Broadway. Where they have found their redemption — and perhaps their financial success — has been in the subsequent productions. For Empire, the latter would be problematic given the nature of the set and the technical demands. In short: the structure of the story needs work — especially in Act I; even after those corrections, the style and feeling of the musical may make it only a moderate success. It doesn’t challenge the medium in the way that it should. Although the story was flawed, I am happy to say that the execution was flawless. The performances were awesome. The technology and stage craft has to be seen to be believed. The costumes were spectacular. The music sounded great. The directorial vision brought this to where it was is remarkable. Nowhere is this better exemplified than in the two leads: Kevin Earley (fan site, FB) as Michael Shaw, the architect, and Stephanie Gibson (FB) as the “Can Do” gal, Frankie Peterson. Earley (who must have a hidden picture on his website, because he doesn’t seem to age at all) has a wonderful voice and brings the right level of earnestness and youthful hope and hubris to the character. He also brings something that Kevin (the real person) has in real life: a remarkable charm and style. We’ve gotten to know Kevin through the shows he’s done in LA, and it is always a joy to see him on stage. Gibson is no slouch either: she also brings a wonderful style and attitude to her character, with strong dancing moves and a great voice. She’s just a delight watch on stage, especially in her Act II scenes. Together, the two have a nice chemistry and interaction. Supporting the leads — and being saddled with the problem of having to tell the real story of the building with the grafted-on fictional story — are Tony Sheldon (FB) as John J. Raskob (the financier of the project), and Michael McCormick as Al Smith, the ex-Governor of New York. Although the performances are good, the characters themselves are stereotypes: the finance man, the heavy drinking politicians, the upper-crust. There are a few other characters that fit somewhere between the main supporting characters and the variety of characters captured by the ensemble members: Betty Raskob, the daughter of the financier [Charlotte Maltby (FB)]; Ethan O’Dowd, a construction worker, head of the riviting gang, and father to be [Caleb Shaw (FB)]; Abe Klayman, the foreman of construction workers [Joe Hart (FB)]; and Bucky Brandt, another construction worker [Tommy Bracco (FB)]. All of these are characters we get to know — but not too deeply. The only exceptions are Betty Raskob and Ethan O’Dowd. Both end up having some significant plot twists that are integral to the story. Both also carry out those plot twists well, and combine those performances with some wonderful smaller singing spotlights. Rounding out the cast is the large ensemble (some also listed above), each of whom play multiple roles as dancers, workers, people in New York, reporters, etc. I’m not going to list all of the character names and positions, but let me list the people and the significant characters: Michael Baxter (FB) [Wolodsky, Ensemble, Dance Captain]; Tommy Bracco (FB) [Bucky, Ensemble]; Richard Bulda (FB) [Pomahac – Mohawk, Ensemble); Juan Caballer (FB) [Nikos, Ensemble]; Caitlyn Calfas (FB) [Hattie, Ensemble] ; Fatima El-Bashir (FB) [Florence, Ensemble]; Tory Freeth (FB) [Hazel, Ensemble]; Joe Hart (FB) [Abe Klayman, Ensemble]; Rachel King (FB) [Agnes, Ensemble]; Katharine McDonough (FB) [Emily O’Dowd; Ensemble]; Gabriel Navarro (FB) [Rudy – Mohawk; Ensemble]; Rachel Osting (FB) [Vera, Ensemble]; Jordan Richardson [Bill Johnson]; Caleb Shaw (FB) [Ethan O’Dowd, Ensemble]; Cooper Stanton (FB) [Menzo, Ensemble]; Michael Starr (FB) [Duryeavich, Ensemble]; Christine Tucker (FB) [Lois, Ensemble]; Rodrigo Varandas (FB) [Jesse – Mohawk, Ensemble]; Josh Walden (FB) [Pakulski, Ensemble]; and Justin Michael Wilcox (FB) [De Caprio, Ensemble]. All of the ensemble was a delight to watch during the large dance numbers, exhibiting strong movement. Most importantly, they seemed to be having fun with the show and with their characters. This is important, because the joy of performance becomes energy that is beamed out to the audience and fed back with enthusiasm. This large cast was under the direction of Marcia Milgrom Dodge (FB), who also served as choreographer. The directorial vision was strong here, especially in how the characters interacted with the set. The choreography was also fun to watch; Dodge was assisted on the choreography side by Michael Baxter (FB). Flying sequence choreography was by Paul Rubin (FB). Sariva Goetz (FB) served as music director, and conducted the large and talented orchestra. Other orchestra members were: Brent Crayon (FB) [Associate Conductor, Keyboard I]; Alby Potts (FB) [Keyboard II]; Jeff Driskill (FB) [Flute, Piccolo, Clarinet, Alto Sax]; Dave Hill/FB [Clarinet, Flute, Alto Sax, Soprano Sax]; Phil Feather (FB) [Oboe, English Horn, Clarinet, Tenor Sax]; Bob Carr [Bassoon, Clarinet, Bass Clarinet, Baritone Sax]; Michael Stever (FB) [Lead Trumpet, Piccolo Trumpet]; Don Clarke/FB [Trumpet, Flugel Horn]; Adam Bhatia (FB) [Trumpet, Flugel Horn]; Charlie Morillas (FB) [Trombone]; Toby Holmes [Bass Trombone, Tuba]; Mark Converse (FB) [Drums, Percussion]; and Tim Christensen [Acoustic / Electric Bass, Contractor]. Score Supervision was by Deborah Hurwitz (FB). Orchestrations were by Michael Starobin (FB). On the production and creative side: Much has been written about the scenic design of this show. More than any other show I have seen, this show was dependent on projections. The basic scenic design was a large silver flat with multiple levels and doors that could open, portions of which could slide forward to varying degrees. Projected onto this, from multiple directions so as not to create shadows, were the scenic backdrops and some props. Characters interacted with the scenery as if it was really there. This was a remarkable illusion — I’ve never seen projections used so effectively before. Credit on this goes to David Gallo (FB) [Scenic Designer, Co-Projection Designer] and Brad Peterson (FB) [Co-Projection Designer]. These were supported by the property design of Terry Hanrahan and the technical direction of David Cruise/FB. I’m not sure this design could have been done even a few years ago — the creative use of computers and projects and graphic design makes this show possible, just as the elevator is what made the Empire State Building possible. The costume design of Leon Wiebers (FB) was also spectacular — especially the costumes for the ladies. Particular striking was the red outfit that Frankie wore in Act II. The costumes worked well with the Hair, Wig, and Makeup design of Rick Geyer. The lighting was by Jared A. Sayeg (FB) and was up to his usual excellent standards — which were made particularly complicated by having to work around the heavy use of projections, which can play havoc on lighting. Philip G. Allen (FB)’s sound design was strong and clear, although there were a few minor mic glitches. Remaining production credits: David Elzer/Demand PR (FB) [Publicity]; Jill Gold (FB) (FB) [Production Stage Manager]; Nicole Wessel/FB [Assistant Stage Manager]; Lily Twining (FB) [Production Manager]; Buck Mason (FB) [General Manager]; Julia Flores (FB) [Casting Director]. Empire – The Musical was produced by The La Mirada Theatre for the Performing Arts (FB) and McCoy Rigby Entertainment (FB), Sue Vaccaro (FB), Ricky Stevens (FB), and The Rivet Gang. 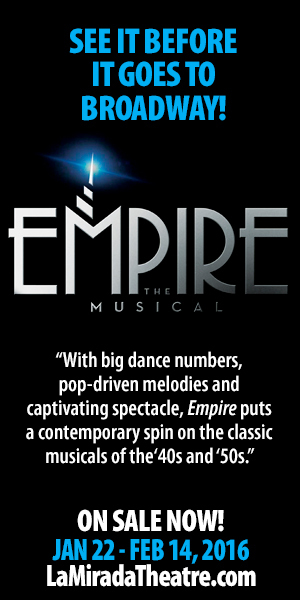 Empire – The Musical continues at The La Mirada Theatre for the Performing Arts (FB) until February 14, 2016. Tickets are available through the online box office; discount tickets are available on Goldstar. Ob. Disclaimer: I am not a trained theatre critic; I am, however, a regular theatre audience member. I’ve been attending live theatre in Los Angeles since 1972; I’ve been writing up my thoughts on theatre (and the shows I see) since 2004. I do not have theatre training (I’m a computer security specialist), but have learned a lot about theatre over my many years of attending theatre and talking to talented professionals. I pay for all my tickets unless otherwise noted. I am not compensated by anyone for doing these writeups in any way, shape, or form. 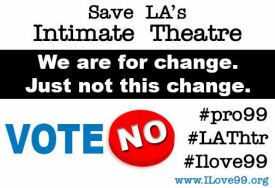 I subscribe at three theatres: The Colony Theatre (FB), Cabrillo Music Theatre (FB), and I just added the Hollywood Pantages (FB). In 2015, my intimate theatre subscription was at REP East (FB), although they are reorganizing and (per the birides) will not start 2016 shows until August. Additionally, the Colony just announced that the remainder of their season has been cancelled, so the status of that subscription is up in the air. Through my theatre attendance I have made friends with cast, crew, and producers, but I do strive to not let those relationships color my writing (with one exception: when writing up children’s production, I focus on the positive — one gains nothing except bad karma by raking a child over the coals). I believe in telling you about the shows I see to help you form your opinion; it is up to you to determine the weight you give my writeups. Upcoming Shows: February theatre continues this evening with “An Act of God” at the Ahmanson Theatre (FB). There’s a rare mid-week performance on February 9 of The Jason Moran Fats Waller Dance Party at the Valley Performing Arts Center (VPAC) (FB). The following weekend brings the Southern California premiere of the musical Dogfight at the Chance Theatre (FB) in Anaheim Hills. The third weekend in February is currently open, but that is likely to change. February closes with The Band of the Royal Marines and the Pipes, Drums, and Highland Dancers of the Scots Guards at the Valley Performing Arts Center (VPAC) (FB). March starts with “Man Covets Bird” at the 24th Street Theatre (FB) on March 6 (the day after the MRJ Man of the Year dinner) The second weekend of March is open, thanks to the cancellation of “Another Roll of the Dice” at The Colony Theatre (FB). The third weekend of March takes us back to the Pasadena Playhouse (FB) to see Harvey Fierstein’s Casa Valentina. The last weekend of March is being held for “A Gentleman’s Guide to Love and Murder” at the Ahmanson Theatre (FB) (pending Hottix). April will start with Lea Salonga at the Valley Performing Arts Center (VPAC) (FB) on April 1 and an Elaine Boosler concert at Temple Ahavat Shalom on April 2. It will also bring the Turtle Quintet at the Valley Performing Arts Center (VPAC) (FB), “Children of Eden” at Cabrillo Music Theatre (FB) , and our annual visit to the Renaissance Faire (Southern). As always, I’m keeping my eyes open for interesting productions mentioned on sites such as Bitter-Lemons, and Musicals in LA, as well as productions I see on Goldstar, LA Stage Tix, Plays411 or that are sent to me by publicists or the venues themselves. Recently, I’ve been listening to a lot of podcasts on theatre. One of these, the excellent Producers Perspective podcast, has been focusing on the musical Spring Awakening, and its transfer back to Broadway. The composer and lyricist both said the same thing about the music and lyrics: their goal was not to move the story forward through the music and lyrics, but to use the music and lyrics to illuminate the inner thoughts and turmoil of the characters — to get inside the head. Such a use of music requires much less suspension of disbelief. This approach to music and lyrics was evident last night in the musical we saw last night at The La Mirada Theatre for the Performing Arts (FB) — “First Date”, with book by Austin Winsberg (FB) and music and lyrics by Alan Zachary and Michael Weiner (FB). I first became aware of the musical First Date when Amazon recommended the cast album. I picked it up shortly after it came out (in February 2014), and found that I liked the music. The story sounded interesting, and so when I learned that La Mirada was doing the first Southern California production of the show, I set the tickler on Goldstar to let me know when tickets were available. We blocked off a date, picked up tickets, and braved the traffic (is the traffic between the San Fernando Valley and La Mirada ever clear on a Saturday afternoon?) . I’m glad we did. First Date ostensibly tells the story of Aaron and Casey. It is Aaron’s first blind date, and one of far too many for Casey. They meet at some fancy New York bar and restaurant, because (of course) New York has the only interesting dating scene. The one-act, no-intermission show is the story of that date, and most of the songs are visualizations of inner dialogues occurring in the head of either Aaron or Casey. In fact, only about three songs are performed by actual characters in the real world. You can find a fuller synopsis on the Wikipedia page. The songs themselves are reasonably cute and funny. From listening to the CD, I was aware ahead of time of “The Girl for You”, and I found it equally funny on the stage — although the Jewish stereotypes were a bit too heavy-handed for me (but then again, this is on the border of Orange County, so they might not recognize Jews without the stereotypes, but then again, Temple Beth Ohr is just up the street). All three “Bailout” songs were cute and well executed. I was particularly taken with the song “Forever Online” (which, alas, is not on the original cast album and does not appear to have been recorded separately). This song tells the perils of dating in a world of Google, where everything you’ve ever said or posted online lives forever to embarrass you — it makes a great (and humorous) warning songs. Also cute was the song “In Love With You”, where Aaron confronts some issues from his past (I’d say more, but it would destroy the surprise of that song). Although the music and story is good, there are a few weaker points. The interlude of the Waiter’s song was (to me) a bit pointless and left you wondering why it was there: it wasn’t from a principal character, and it wasn’t illuminating the background of why the characters were what they were. I would have preferred another song of illumination instead. But on the whole, the show was funny and well executed. The direction of Nick Degruccio (FB) worked well, making the characters reasonably believable, and handling the various costume and character changes of the ensemble well. The shouldn’t come as a surprise: the presence of Mr. Degruccio as the director of a musical pretty much guarantees you’re going to be seeing something of high quality. In the lead positions as the couple on the date were Marc Ginsburg (FB) as Aaron, and Erica Lustig (FB) as Casey. Both were new to us; we haven’t had the opportunity to see them before on Southern California stages (although they’ve done some shows). They both came across as cute, and they had believable chemistry together — a good thing for a first date :-). Both had strong voices and used them well — particularlyMarc in “In Love with You” and Erica in “Safer”. The remainder of the cast played multiple characters as well as background restaurant patrons. Alas, the song credits only provide the character at the time, whereas the cast credits are the generic ensemble names, so it is difficult to map performers to songs. Combining information from the Broadway World Photo Coverage and cast allocations from Broadway gives: Justin Michael Wilcox (FB) [Man #1: Gabe/Edgy British Guy/Gilberto]; Leigh Wakeford (FB) [Man #2: Reggie/Aaron’s Future Son/Edgy Rocker Guy]; Scott Dreier (FB) [Man #3: Waiter/Casey’s Father/Blaze/Friendly Therapist]; Stacey Oristano (FB) [Woman #1: Grandma Ida/Lauren/Aaron’s Mother]; Kelley Dorney (FB) [Woman #2: Allison/Google Girl/Reggie’s Mom]. Now that we have the mapping, I can note some particular highlights: Dorney was particularly strong as Allison (especially on the performance and reaction side) and as the Google Girl in “Forever Online”. Wilcox was fun in his characterization of Gabe, the friend of Aaron, particularly in Allison’s Theme and his reactions in “In Love With You”. Wakeford was funny as Reggie in the various Bailout songs and in the final scenes — it was a character my wife particularly enjoyed. Dreier was funny performance-wise as the waiter; although I wasn’t particularly crazy about “I’d Order Love”, he performed it well. Lastly, Oristano had a great characterization as Casey’s sister Lauren. The choreography by Lee Martino (FB) worked well given the stage and the set; Leigh Wakeford (FB) served as dance captain. The show was under the musical direction of Brent Crayon (FB), and featured orchestrations by August Eriksmoen (FB) and vocal and incidental music arrangements by Dominick Amendum (FB). Brent Crayon (FB) also served as conductor and keyboard 1 for the First Date Band; additional members of the band were: Mike Abraham (FB) [Guitar 1]; John Ballinger (FB) [Guitar 2 / Keyboard 2]; Sean Franz (FB) [Reeds / Keyboard 3]; Jonathan Ahrens [Bass]; and Eric Heinly (FB) [Drums]. In general, the music was played well and sounded great. However, for the first few scenes, the music sounded a bit muffled and overpowered the lyrics. This was corrected as time went on, so it was more of a sound issue. On the technical side, the scenic design by Stephen Gifford (FB) was a modernist restaurant that was reasonably realistic; a greater sense of the scenes and place came from the properties design of Terry Hanrahan (FB). The costume design of Thomas G. Marquez (FB) worked very well, especially considering the last minute changes that had to occur onstage. The lighting by Steven Young (FB) worked well; in particular I noted the use of the lighting during the “Bad Boys” song. The sound design by Josh Bessom (FB) was initially a little off — the vocals were a bit muffled and the orchestra overpowering, but that was adjusted 2-3 songs in and was great for the rest of the show. Remaining technical credits: Katie McCoy (FB) [Hair Design]; Julia Flores (FB) [Casting]; Buck Mason (FB) [General Manager]; David Cruise (FB) [Technical Director]; David Elzer/Demand PR (FB) [Publicity]; Amy Ramsdell (FB) [Assistant Stage Manager]; Jill Gold (FB) [Production Stage Manager]. 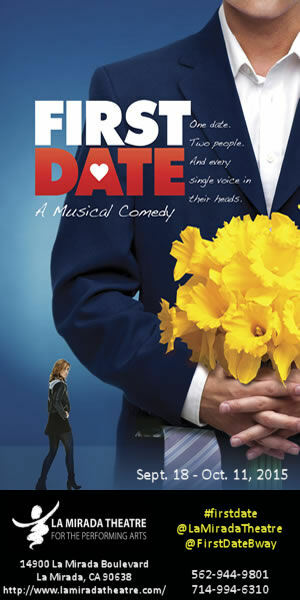 “First Date” was produced by The La Mirada Theatre for the Performing Arts (FB) and McCoy Rigby Entertainment (FB). First Date continues at The La Mirada Theatre for the Performing Arts (FB) through October 11. 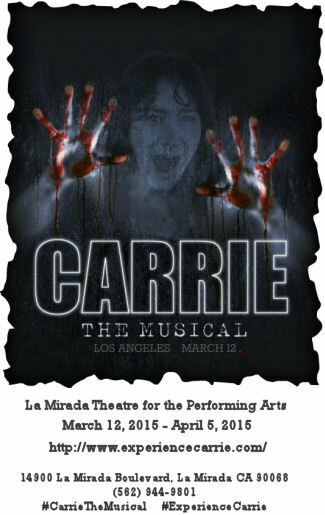 Tickets are available through La Mirada; discount tickets may be available through Goldstar. It’s a fun show and worth seeing. P.S. to the person sitting two seats to the left of me: When they say turn off your cell phones, that means “turn it off and put it away”. The light from your phone is not only distracting to the actors, it is distracting to the audience — especially when you periodically hold it up to (I guess) take a picture or record (which I’m sure you’re not doing, as it usually isn’t permitted). I didn’t like having to remind you to put it away. Dining Notes: Before shows at La Mirada, we like to go to Mario’s Peruvian for dinner. They aren’t that far away (Imperial Highway and Santa Gertrude), their food is great, and they aren’t that expensive. Finish up, a right onto Santa Gertrude, and a right onto Rosecrans, and a left onto La Mirada and you’re done. Upcoming Shows: October was being held for the NoHo Fringe Festival (FB), but they haven’t announced the Fringe shows yet, so I’ve started booking weekends. The first weekend of October brings “The Baker’s Wife” at Actors Co-op (FB) in Hollywood. The second weekend of October brings “The Best of Enemies” at The Colony Theatre (FB). The third weekend of October takes us to Thousand Oaks for “Damn Yankees” at Cabrillo Music Theatre (FB). The fourth weekend of October brings “Uncle Vanya” at Antaeus Theatre Company (FB) in North Hollywood. Halloween weekend sees me at CSUN for Urinetown, and then both of us out in Simi Valley for “The Addams Family” at the Simi Cultural Arts Center (Simi Actors Rep Theatre (FB)). The following weekend sees us back in Simi for the Nottingham Festival (FB) on November 7. We then go out to Perris for “A Day Out with Thomas” at Orange Empire Railway Museum (FB) on November 11 (I can’t skip seeing my buddy Thomas and his friend Percy). The bookings for November conclude with Deathtrap at REP East (FB) on November 14; the rest of the month is currently open. December brings “Humble Boy” at The Colony Theatre (FB) the first weekend, followed by a mid-week stint as a producer, when we present The Nigerian Spam Scam Scam as the dinner entertainment at the Annual Computer Security Applications Conference (ACSAC). December also has dates held for “The Bridges of Madison County” at the Ahmanson Theatre (FB) and “If/Then” at the Pantages (FB). There are also a few other interesting productions I’m keeping my eyes open for. The first is the Fall show at The Blank Theatre (FB), “Something Truly Monstrous”, sounds wonderful — however, it runs through November 8, so squeezing it in would mean a double weekend. The show at the Kirk Douglas Theatre (FB) also sounds like an interesting exploration of clutter — but “The Object Lesson” only runs through October 4, and I’m not sure we can squeeze it in. As always, I’m keeping my eyes open for interesting productions mentioned on sites such as Bitter-Lemons, and Musicals in LA, as well as productions I see on Goldstar, LA Stage Tix, Plays411. First Date. September 18 – October 11, 2015 (Press Opening September 19). Book by Austin Winsberg. Music and Lyrics by Alan Zachary and Michael Weiner. Directed by Nick DeGruccio. I picked up the CD for this because it had Krysta Rodriguez and have really enjoyed the music. Plus Nick is directing — always a great sign. I’m going to try to fit this one into the schedule. Rent. 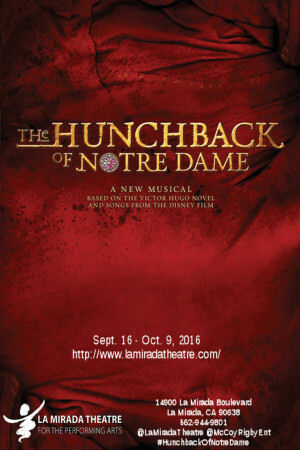 October 23 – November 15, 2015 (Press Opening October 24). Book, Music and Lyrics by Jonathan Larson. Directed by Brian Kite. For Rent, there would need to be something truly different about the production — an intimate setting, some special quirk of casting, some new twist. We essentially have the Broadway version captured in the movie. Empire: The Musical. January 22 – Feb 14, 2016 (Press Opening January 23). Book, Music and Lyrics by Caroline Sherman and Robert Hull. Directed and Choreographed by Marcia Milgrom Dodge. Empire is an original musical about those who bravely embodied the American spirit during the dark days of the Great Depression by building what was then the tallest structure in the world, the Empire State Building. The subject doesn’t entice me, and I haven’t heard for the composer/lyricist. That sets up some red flags. I might withhold judgement on this until I learn some more. Dreamgirls. March 25 – April 17, 2016 (Press Opening March 26). Book and Lyrics by Tom Eyen. Music by Henry Krieger. Directed and Choreographed by Bobby Longbottom. I saw this musical when it was originally out here (and I do mean the original), and the movie is still fresh in my memory. It’s not enough of a unique draw to bring me to La Mirada. The Little Mermaid. June 3- June 26, 2016 (Press Opening June 4). Music by Alan Menken. Lyrics by Howard Ashman and Glenn Slater. Book by Doug Wright. Directed by Glenn Casale. This is about two weeks before it will be at Cabrillo Music Theatre’s (FB) (2015-2016 season), and we’re going to be subscribing to Cabrillo. Pass on another version. Leann Rimes. May 21, 2016 – 2pm & 8pm. A country music entertainer. Not the type of show that’s strong enough to attract me to a concert. Some say that the definition of “insanity” is doing the same thing and expecting different results (others say that that the DSM is wrong and we’re only diagnosing based on symptoms, but that’s later in this post). So, then, are theatre goers insane — we often go and see the same show over and over. Are we expecting different results, or are we just expecting to see the same show? What do we expect to see in the different versions? I can’t answer for everyone, but for me, I see different productions of the same show to find nuances, to see particular actors, and to see how different venues approach the material (especially different sized venues). I’m bringing this all up because last night I went to see a musical about mental illness; a musical that I last saw only a few years ago at the end of 2010. 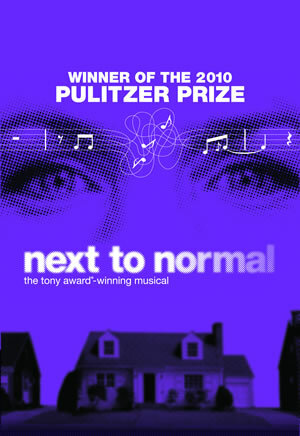 The musical is “Next to Normal” (music by Tom Kitt; book and lyrics by Brian Yorkey), and I decided to see it again because (a) I like the show, but more importantly (b) our experiences with the director and a number of cast members led me to conclude that this would be an excellent production. I wasn’t wrong — it wasn’t insanity to see “Next to Normal” again; rather, it was an experience that was well worth the drive (it was out in La Mirada, where we last saw Johnny Guitar in 2006) and provided additional insights. I also said last time — and I still agree — that Next to Normal is one of the best examples of a musical that needs the stage. Movies tend to be focused in the real (even if that is an alternative reality). What we see on the screen is realistic. Musicals allow the emotions to come out and be expressed, and Next to Normal is all about emotions. If you can find a production of this near you, it is well worth seeing. As I wrote in the beginning, the primary reason I wanted to see this particular production was the director and the cast. I wasn’t disappointed. The director for this show was Nick Degruccio (FB), who has done numerous musicals in the Southern California area … all of which have been great. This show was no exception. Nick brought out the raw emotion from the actors, and connected with the audience (I know it brought out the emotion and me, and I heard others audience members saying something similar). If you have the opportunity to see something Nick directs, do it. The odds are good it will be excellent. The casting for this production was spot on. Back in 2010, I saw the tour with the original Diana, Alice Ripley, in the lead. This production cast Bets Malone (FB) in the lead. We’ve seen Bets in numerous productions at Cabrillo and throughout Los Angeles, and she is consistently one of the best musical performers in Southern California. She didn’t disappoint here — in fact, I think her performance was stronger than Ripley’s because she somehow made the performance and the character seem real and down-to-earth. Also attracting us to the production was Tessa Grady as Natalie, Diana’s daughter. Tessa is another actor we see regularly in roles — we’ve seen her at the Colony and Cabrillo, and have always been impressed with her. She was very strong here, and gave a wonderful performance (I’m running out of superlatives) as the daughter. Diana’s husband, Dan, was also played by Southern California regular, Robert J. Townsend (FB). We saw Townsend in the great production of The Story of My Life at Havok, and in numerous Cabrillo productions. Yet again — wonderful voice, wonderful performances. Rounding out that cast — again, all with spectacular performances — were Alex Mendoza/FB as Henry, Eddie Egan (FB) as Gabe, and Keith A. Bearden (FB) as Dr. Madden. We’ve seen Mendoza before (Justin Love, Cabrillo) and Bearden (Johnny Guitar), but Egan was new to us. All were strong and a delight to watch. Musically, the production was very strong, with musical direction by Darryl Archibald (FB) (another Cabrillo alumni). Archibald also conducted the 6 piece band, which included Archibald on piano, Dave Lofti on Percussion, Joe Jewell (FB) on Guitars, Shane Harry on Electric Bass and Acoustic Bass, Claudia Vanderschraaf/FB on Cello, and Tyler Emerson/FB on the odd combination of Violin and Keyboard. The technical production was also excellent. The scenic design by John Ezell was reminiscent of the set at the Ahmanson, although lacking the eyes. I particularly noted how at points the background was cracked and imperfect. The lighting by Steven Young was also strong and effective, doing a wonderful job of creating the mood. The sound design by Josh Bessom provided clear and crisp sound (better than the production at the Ahmanson, where the orchestra overpowered at times), although there were a few static problems with the mics. The costumes by Kish Finnegan worked well with the characters, and the properties by Terry Hanrahan were effective. The prop/costume package were from the Arizona Theatre Company. David Cruise was the Technical Director. Jill Gold was the production stage manager, assisted by Phil Gold. The executive producers were McCoy Rigby Entertainment. The last performance of Next to Normal is today, June 23. 2013. You can buy tickets online here. Upcoming Theatre and Concerts: Today brings more theatre: “The Taming of the Shrew” at Will Geer’s Theatricum Botanicum. The last weekend of June brings a Maria Muldaur concert at McCabes, as well as “Man of No Importance“ (Hollywood Fringe) at the Lillian. July starts with a musical we had originally planned for Fathers Day weekend: “Ionescapade” at the Odyssey Theatre Ensemble. That will be followed by “9 to 5 – The Musical” at REP East in the middle of the month, and “Legally Blonde – The Musical” at Cabrillo at the end of the month. 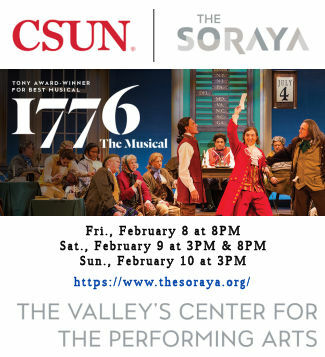 July will also (hopefully) see us as OperaWorks at CSUN. August is currently completely open due to vacation planning, although we may see a show at the Lawrence Welk Resort in Escondido at the end of the month (depending on price), or at another venue in San Diego.